Amrapali Dubey, Dinesh Lal Yadav’s kissing photo goes viral! 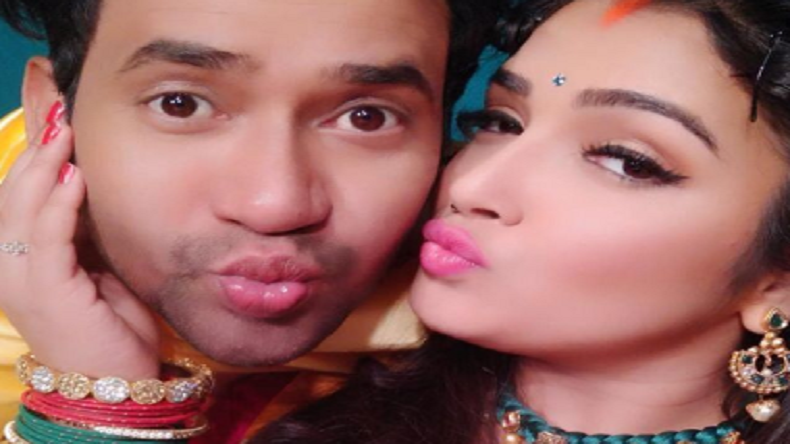 Amrapali Dubey, Dinesh Lal Yadav's kissing photo goes viral: The on-screen power couple of the Bhojpuri film industry, Dinesh Lal Yadav aka Nirahua and YouTube queen Amrapali Dubey's photo has taken social media by storm and is being loved by fans, have a look! Amrapali Dubey, Dinesh Lal Yadav’s kissing photo goes viral: The hot Bhojpuri on-screen couple—Dinesh Lal Yadav aka Nirahu and Amrapali Dubey are always in the news for their adorable photos and videos which they keep sharing o their social media accounts such as on Instagram, Facebook and Twitter. In a throwback photo, we see Amrapali Dubey and Dinesh Lal Yadav aka Nirahu making a cute and intimate pose with each other in which they are giving a peck to each other! The photo is way too cute and both Amrapali and Nirahua are looking perfect with each other in the picture which has gone viral on the Internet! In the photo, Amrapali Dubey looks stunning in a purple and red saree with pretty bangles. Both Dinesh Lal Yadav aka Nirahu and Bhojpuri YouTube queen Amrapali Dubey are very popular actors in the Bhojpuri film industry. They are also one of the best and on-screen power couples of Bhojpuri cinema and their sizzling on-screen chemistry is loved by fans! They have worked in several Bhojpuri films such as Nirahua Hindustani, Patna Se Pakistan, Nirahua Rikshawala 2, Bam Bam Bol Raha Hai Kashi, Nirahua Hindustani 2, Nirahua Hindustani 3, among many others. They keep sharing adorable photos with each other on Instagram and their latest photo has taken over social media.